Handcrafted for longevity and designed to fuse the luxurious with the practical, our leather breast wallets are slimline yet capacious. A plenitude of slots provides room for multiple credit and business cards, which is enhanced by the full length, suede-lined note pockets. Whether Saffiano or smooth, each wallet emanates quiet refinement, underlined by inherent durability. Explore our full range of men's leather wallets and discover something to meet every need, including our pared back credit card wallets. Aspinal leather breast wallets are a favourite gift for men. Breast wallets offer a much larger capacity for credit cards and notes than traditional wallets. Each leather breast wallet is handmade in our workshops using only the finest selected vegetable tanned premium grade leather, hand-dyed and hand waxed to a superb finish. The leathers we choose not only look extremely beautiful but they are hard wearing to stand the test of time. Hand cut and sewn with meticulous detail, the corners are strengthened to avoid tearing and each wallet is lined with beautiful contrasting suede, a design element which is unique to Aspinal and complements the leather perfectly. Inside, even each pocket is lined with moire© silk. The dedication of our team ensures that each breast wallet will be used and enjoyed for many years to come. All the leathers used to create our breast wallets can be personalised in gold or silver foil or monogrammed with plain embossed initials. 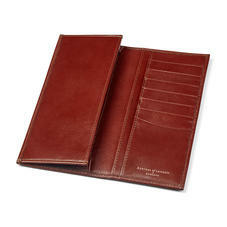 Aspinal leather breast pocket wallets have a 30 day returns policy (excluding personalised wallets) as well as a 12 month Aspinal guarantee for repair and/or replacement.